Tens of Thousands of Palestinians Seeking Basic Supplies Flood Egypt for Second Day | Democracy Now! Palestinian journalist from Rafah. He writes for several publications including the Washington Report on Middle East Affairs. He maintains a blog at RafahToday.org. Israeli journalist with Ha’aretz newspaper. He was recently awarded the 2008 Euro-Med Journalist Prize for Cultural Dialogue. AMY GOODMAN: Thousands of Palestinians are pouring into Egypt from Gaza for a second consecutive day after militants destroyed most of a border wall in the town of Rafah on Wednesday. Gazans are rushing across the border to stock up on food, fuel, medicines and other basic supplies, which have become scarce or unaffordable after months of economic isolation. Hundreds of Egyptian security forces have moved into the area but are so far making no attempt to stem the traffic. According to Time magazine, over 350,000 Palestinians have crossed the border, nearly one-fifth of Gaza’s entire population. Dismissed Palestinian Prime Minister and Hamas leader Ismail Haniyeh said the border crossing is a direct result of the siege. ISMAIL HANIYEH: [translated] What happened at Rafah was an expression of a popular rage, and it is evidence that despair has reached its climax and the siege cannot continue. AMY GOODMAN: The border crossing comes on the sixth day of an Israeli blockade that has cut off all deliveries to Gaza. Israel says it’s trying to stop Palestinian militants from launching rockets at nearby Israeli towns. Over the past ten days, more than 200 rockets and mortars have been fired into Israel, lightly wounding ten people. Meanwhile, over the same period, Israeli army raids in Gaza have killed more than forty people. Israel said it bears no responsibility for security at the Rafah crossing but expects Egypt would reseal the border with Gaza and stop allowing the free passage of Palestinians. This is Israeli Foreign Ministry spokesperson Aryeh Mekel. ARYEH MEKEL: Israel has no presence in that area. It is the Egyptians that are stationed alongside the border between Gaza and Egypt, and therefore it is the responsibility of Egypt to ensure that the border operates in a proper way according to the signed agreements. We expect the Egyptian government to solve the problem. AMY GOODMAN: But Egyptian President Hosni Mubarak has not indicated when he plans to close the crossing. He told reporters Wednesday he allowed Palestinians to come into Egypt because they’re starving. President Mubarak’s comment came after days of protests against the Egyptian government’s support for Israel. PRESIDENT HOSNI MUBARAK: [translated] Let them come in and buy food, then go back, as long as they are not carrying weapons. And I even spoke to the government. And if they need food or the authorities that can help feed them, we are willing to help them. AMY GOODMAN: For the latest news from Gaza, I’m now joined on the phone from Gaza by Palestinian journalist Mohammed Omer. He lives in the Rafah refugee camp and writes for several publications, including the Washington Report on Middle East Affairs. He maintains a blog at rafahtoday.org. He just returned from there and joins me on the line from Gaza City. Welcome to Democracy Now!, Mohammed. Can you describe what’s happening now on the border? And also breaking news, I have received some information from the spokesman of Minister of Health telling me that a group of doctors from Egypt have managed to come to Gaza to operate for Palestinian patients in the Palestinian hospitals, and they were bringing some medicine with them. In the Gaza Strip, most of the people are going towards the south, and they are heading to the south. They’re trying to get medicine, food and all their needs. I’ve met with some people. Among the people is Saad al-Buleimi [phon. ], thirty-four years old, and his brother Mohammed. And they couldn’t believe that Rafah border is open. They are living in the middle of the Gaza Strip, and it’s time for them — both of them have shared and carried their mother, who has been stuck in Gaza for many months, and she couldn’t get out to go for operation in Egypt. Then, today, she was able to get through and go for the hospital for her operation. AMY GOODMAN: Mohammed Omer, Time magazine has said 350,000 Palestinians have crossed into Egypt, a fifth of the population of Gaza. Is that possible? MOHAMMED OMER: It is possible. And I can tell you the number is increasing today. Yesterday, people were not believing that. They were staying mostly home. But still, the number was large enough to describe more than 200,000 people who are crossing. But today it’s much more than that. Wherever you go in the streets, you ask people, “Where are you going?” they say Rafah. Everyone is heading to Rafah. They’re going to Rafah to buy things. And what they are buying — I’ve seen people buying cows and buying veal and buying sheep and buying cheese and buying medicine, and some who buy also fish and some who buy medication and some — so there are different people. And even some people that I found buying candles, because there is no candles any longer in the Gaza Strip, due to the siege involved in Gaza. And I’ve also talked to some people, and I’ve figured out that they are buying also washing powder, which wasn’t allowed into the Gaza Strip during the last few weeks by the Israeli occupation forces. So people are quite happy right now, getting closer to the border. But the problem that they could not go as far as — after El Arish. They can just go inside the area of Rafah, the Egyptian Rafah, and El Arish area in Egypt, but it is difficult for them to get as close as that. I can see also some numbers of people in wheelchairs, mostly the people who were injured in the last few attacks, getting out through the Rafah terminal crossing by their families who take them to the near hospital for medication. AMY GOODMAN: Is Israel still attacking Gaza? MOHAMMED OMER: There is a military buildup right now in the northern part of the Gaza Strip. Nearly fifty tanks are patrolling in the northern part of the Gaza Strip. I’m not sure if that’s a start of a new attack or if that’s a normal regime of patrolling. But there is also hovering of F-16s and helicopters from time to time. There has been no major attacks in the last twenty-four hours since the people have managed to cross through the Egyptian border. But the last period has been quite difficult for the Palestinian population in the last week. Since the 1st of January — or sorry, since the 1st of January, 2008, seventy-six Palestinians were killed by the Israeli occupation forces, and 293 were injured also by the Israeli occupation forces, only in the last month, this month, in January, while on the other hand, from eight to six Israelis were injured as a result of more than 150 Kassam rockets, homemade rockets, launched from Gaza. The situation is still not easy. There are still people, despite the fact, who still have the mourning tents, as they have lost their relatives. And still, the hospitals are treating the people who were injured as a result of the recent attacks on Gaza. In general, the mood in Gaza, most of the people are desperate to go to Egypt, some who go for the medication, some who go to buy things. But the people are quite happy that now there is a chance for them to get out and get what they need. But the thing also that there is not that much supplies in the Egyptian stock now, because many people take the empty gallons, and they try to go to fill it in with petrol in order to heat their houses or to light their houses, since Israel has taken the decision to shut off all the borders again, and they say that Egypt is going to take responsibility over the Gaza Strip, which means that no aid will come to the Gaza. And I’ve talked also to the spokesman and head of the [inaudible] Palestinian generation company, and he confirmed to me that they know that the Palestinian — the Israeli side has stopped supplying Gaza with the fuel. And he was afraid that it might mean that one of the main generators in the Gaza Strip will end, will stop by the end of the day or at least at the end of the day or ’til the evening as a result of the shortages of fuel coming to the Gaza Strip through the Karni crossing. AMY GOODMAN: We’re talking to Mohammed Omer. He is a Palestinian journalist who lives in the Rafah refugee camp in Gaza. Originally, at the beginning, the Egyptian forces opened fire on the border in Rafah, the Egyptian government coming under fierce criticism for that. What happened? MOHAMMED OMER: That was on Wednesday, when a group of people — or it was on Tuesday, when a group of people went to the border, mainly women affiliated to Hamas, went to the border and tried to open the border. I was in the area myself, and I saw that, and I saw the — there was some clashes. They were trying to push the women back. But the problem here, that they could not do that in the next day. The first day they have managed — they succeed, because the number of the women were not great. It was nearly 2,000 women with some men who were coming through, trying to break into the siege. They were having thirty injured people and sick people who need medication in Egypt, and they were calling the Israeli security forces — sorry, the Egyptian security forces to let them inside, but then they did not let them inside as a result of that. And for that situation, since then, nearly since — the problem that — what happened, that they lived nearly — that Israel, according to Camp David agreement that allows only 750 soldiers, Egyptian soldiers, to patrol on the border. They could not allow more people to be on the border or more soldiers to be on the border. For that reason, it was difficult also to control the large numbers of people who were flooding into the borderline. I’ve talked to a spokesman and one security officer at the Egyptian side, and he confirmed to me that it was also a humanitarian issue, that we could not watch our brothers in Gaza and our sisters in Gaza starve to death, and we just watching like that. We had to open the border for them to come for a few days to get food and to get the basic things that they need. As long as they don’t bring weapons or take weapons, then they just take the medicine and take what they need and then leave. So this is — it came from a humanitarian side, but it’s also that Israel has restricted the number; 750 Egyptian soldiers are allowed only to be in the border. But I would expect if there is a more number of soldiers, it might be that they would have stopped them. But they say it’s a humanitarian issue, and for that reason they have decided to let the people go through. Now the Egyptian security forces are watching people at the moment, while they are crossing in, but they are mainly not preventing them. They are only preventing them from going as far into Egypt, like Alexandria or Cairo or Al-Isma’iliyah. But they are allowing them in just the area of El Arish and Rafah border area, where most of the stocks, unfortunately, have run out of fuel. The petrol stations have run out of fuel at the moment in Egypt, this part, because it’s not possible for people to get the medication they need, when they went to the pharmacy to look for medication. And they found even the pharmacies have no medicine at all left, because the people are taking as much as possible, believing that the siege has not ended and it will continue for the next few months, at least. AMY GOODMAN: Mohammed Omer is a Palestinian journalist living in the Rafah refugee camp, speaking to us from Gaza City. Right now, we’re going to go to break. When we come back, we’re also going to go to Tel Aviv to talk with Israeli journalist Gideon Levy, and we’re going to look at the US presidential candidates’ stand on the Israel-Palestine conflict. Stay with us. AMY GOODMAN: We go now to Tel Aviv to Israeli journalist Gideon Levy, who is a regular columnist for Haaretz newspaper, recently awarded the 2008 Euro-Med Journalist Prize for Cultural Dialogue. 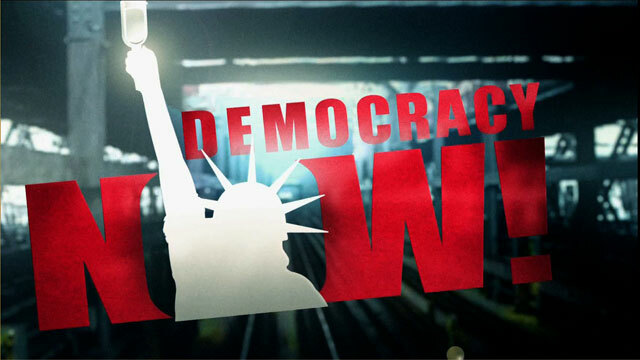 Welcome to Democracy Now!, Gideon Levy. Your response to what’s happening in Gaza right now and the Israeli government saying this is now the Egyptian government’s responsibility? GIDEON LEVY: I think nobody should be surprised. When you try to make an experiment in human beings, putting them into a huge cage for months and months, you can’t expect that they will not do anything possible to find a way out. And anyone who claims he’s surprised for what happened really is not understandable. I also understand the Egyptian attitude. What could they do? They couldn’t stand and shoot in hundreds of thousands of people, of refugees, who are trying to get some food, as simple as this. Unfortunately, I’m not sure that the situation will remain for long, and I’m afraid that very soon the siege will be completed again, and again we’ll face this humanitarian catastrophe in Gaza. AMY GOODMAN: Gideon Levy, the figures from the United Nations right now, they are saying 79 percent of Palestinians in Gaza Strip live in poverty. The water supply to the Gaza Strip is approximately half the international standard, the UN saying Palestinians say 40 percent of Gazans lack drinking water. Are these the figures that you understand? GIDEON LEVY: Those are the almost minimal figures, because I don’t deal with figures, I deal usually with human beings. And I have a few friends there who keep on informing me. Unfortunately, the Israeli government, the Israeli IDF, the Israeli army, does not let Israeli journalists into Gaza in the last fourteen or fifteen months. So I’m better informed over the phone. And I can tell you that all the statistics are nothing vis-a-vis the reality. People are waking up in Gaza into a reality which I don’t think many Westerners, including Israelis, can imagine it at all: no future, no perspectives, no fuel for the car, no electricity in those very, very cold nights, and big life threat day after day, because don’t forget that the Israeli army is being active there almost every day from the air, from the sea and also from the territory itself. AMY GOODMAN: And, Gideon Levy, speaking to us from Tel Aviv, the response overall in Israel? I mean, the rationale of the Israeli government not to allow Israeli journalists into Gaza to Rafah, their rationale, and what is the population saying? GIDEON LEVY: Could you repeat the last part of your question? AMY GOODMAN: What is the Israeli population response to this right now? And what’s the Israeli government rationale for keeping you out of Gaza? GIDEON LEVY: Yeah. Unfortunately, for a long time, the Israeli public opinion is quite indifferent to the Palestinians’ agony, to the suffering, to the life under occupation in general. And same for now. People are only concerned if weapons will be smuggled into Gaza now, when the gates are open, and nobody really shares any kind of — maybe I’m naive to expect it, but nobody shares any kind of solidarity with 1.5 million people, who most of them are innocent people who wish only to find some work, some food and some way of normal living. Now, about us, the Israeli journalists, we are prevented to go into a Gaza ever since Hamas is in power. And this is also something that should be mentioned, because I think, by this, the Israeli government prevents us from informing our readers or our viewers how does it really look there in Gaza. We could understand it if it was the last few weeks, because they were claiming that there are warnings that we may be kidnapped. But now, when it became a constant situation of over one year, it’s really a source of concern. The problem is that nobody really cares in Israel, because nobody really cares in Israel about life in Gaza. AMY GOODMAN: Gideon Levy, speaking to us from Tel Aviv, he’s a columnist for Haaretz newspaper. Thanks for joining us from there. NEXTWhere Do the Presidential Contenders Stand on the Israeli-Palestinian Conflict?